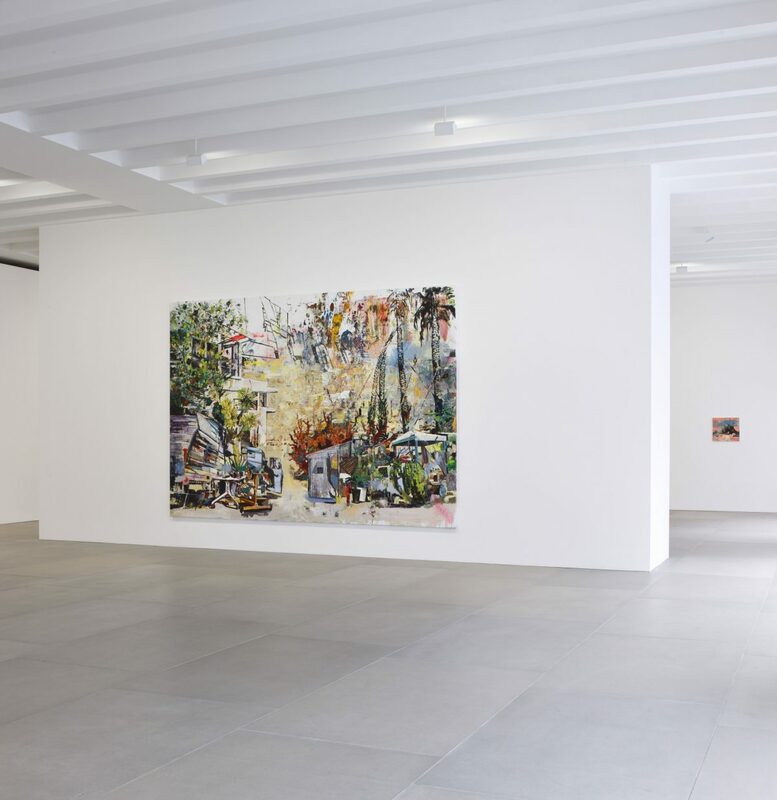 Blain|Southern is delighted to present Hypernova, an exhibition of new work by Romanian painter Marius Bercea. 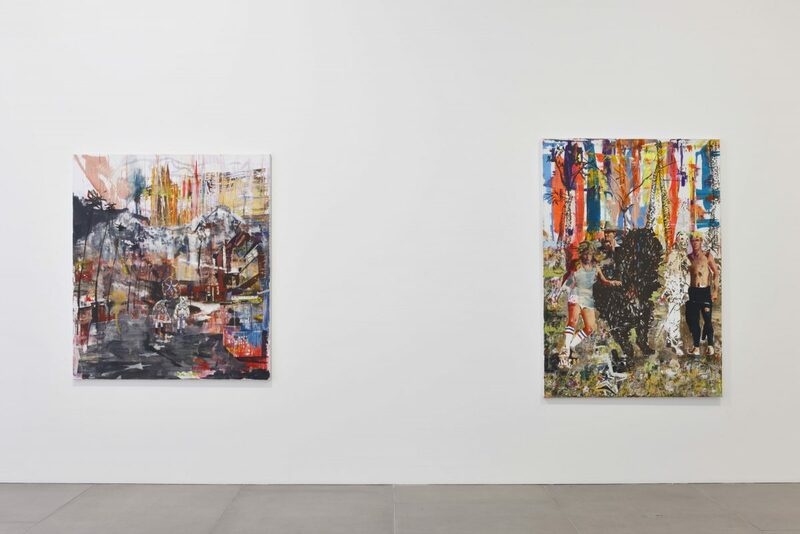 Recording the artist’s travels from his Transylvanian hometown of Cluj to California and the city of Los Angeles, Hypernova illustrates a sensory, psychological journey as much as a geographical one. 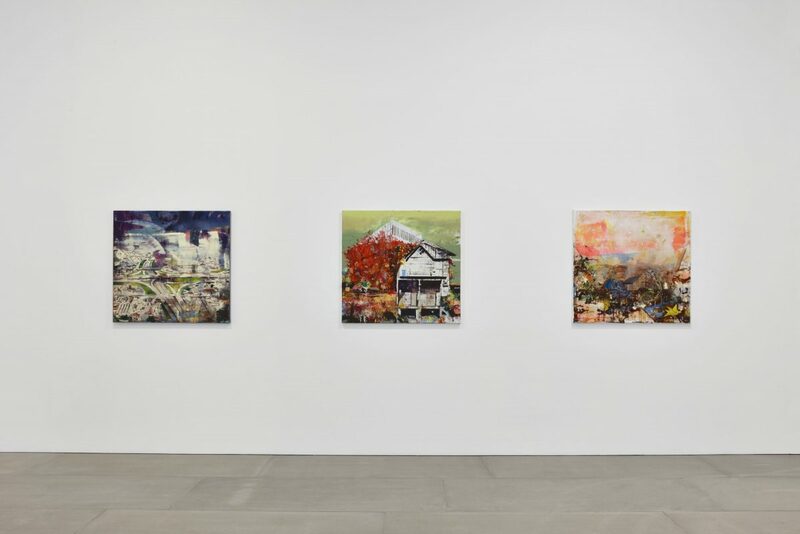 Amalgamating an array of iconic imagery that exists across Romanian and American culture, Bercea has created a diverse series of vibrant landscapes that fluctuate between the utopian and dystopian, between flux and stasis, blurring the boundaries between reality and imagination. 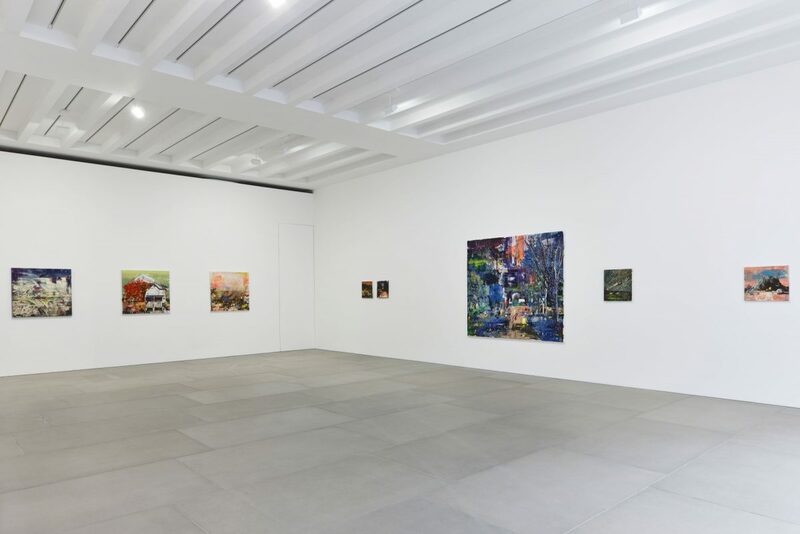 This body of work represents an overlapping of two topographical icons: Transylvania and California, in which the city of Cluj and the surrounding Carpathian mountains converge upon the canvas with a range of new and alien Californian environments, from the solitude of the Mojave desert to the hills of Hollywood. 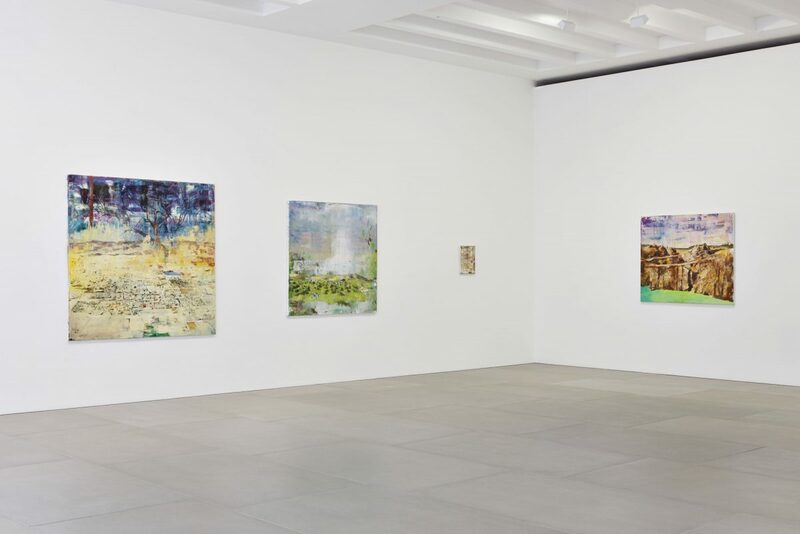 The show is divided into two sections; the first room displays grounded, tangible reflections of locations from Bercea’s journey, whilst the second, through vibrant explosions of colour, reveals a more fantastical approach that becomes increasingly spiritual and mystical. 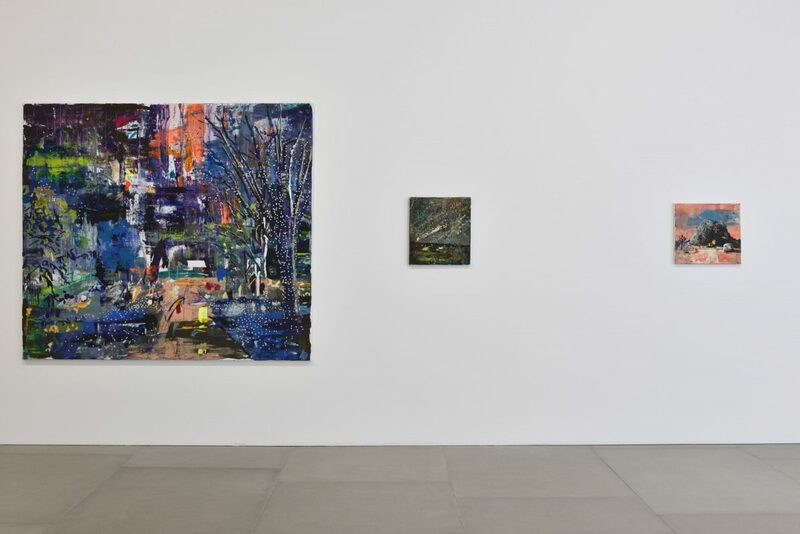 Often verging on the surreal, these works bring together Bercea’s sublime visions of the natural world with the jarring electric lights and sprawling architecture of urban developments. Speed Sterility (2013) presents us with a series of highways leading out of Los Angeles into the desert. An earthy palette underlies dense areas of geometric structures, outlined in streaks of purple and black, or jutting upwards against a foreboding sky of crimson and dark blue. These modernist constructions dominate the skyline, and whilst their white sheen gives off a sense of once progressive design, Bercea simultaneously portrays them in states of seeming disappearance and decay. Slipping in and out of immediate focus, urban life is conveyed in a wash of dynamism and transience. In Electric Snow (2013) both foreground and background glisten with radioactive colour. The scene could be night or day, indoors or out. 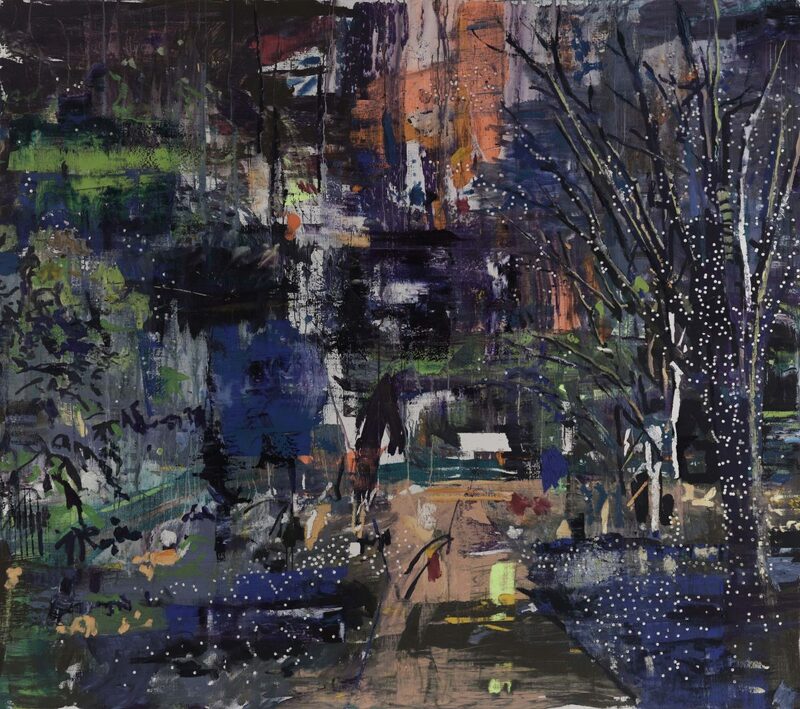 Bercea’s fascination with the melding of natural and artificial light is evident throughout the composition, in which the phosphorescent orange glow of the night sky is seemingly echoed in flashes of luminous colour across the suggestions of towering city buildings. In the midst of this scene, struggling for room to breathe, is the subtle presence of a traditional Romanian peasant house. The shapes of trees melt into their surroundings, glittering with specks of white light on beds of blue snow. 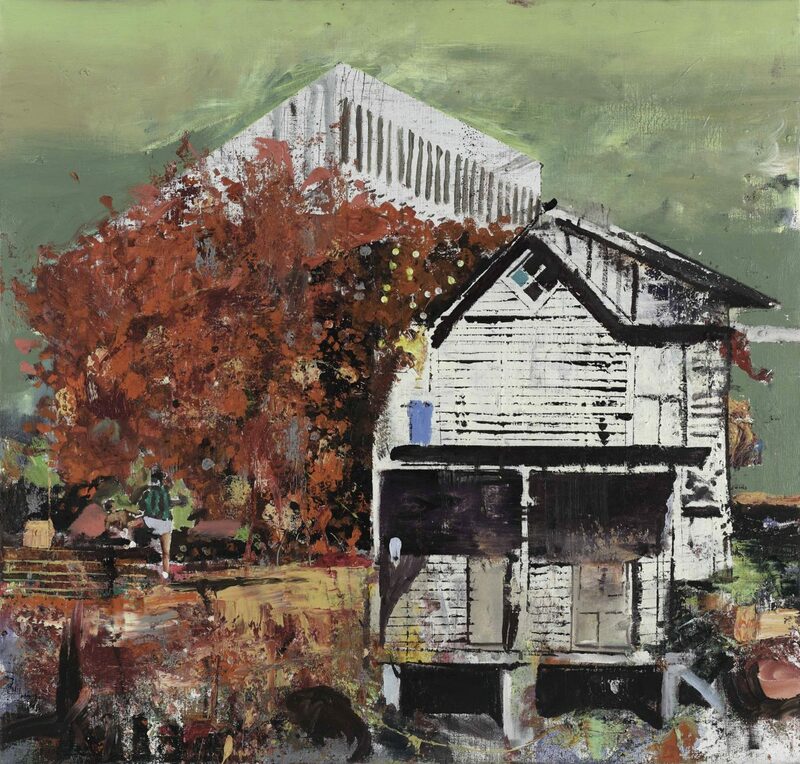 Demonstrating a suffocation of the rural landscape by the electric lights of the city, Bercea presents himself as an emotional observer of the effects of the consumerist phenomenon. 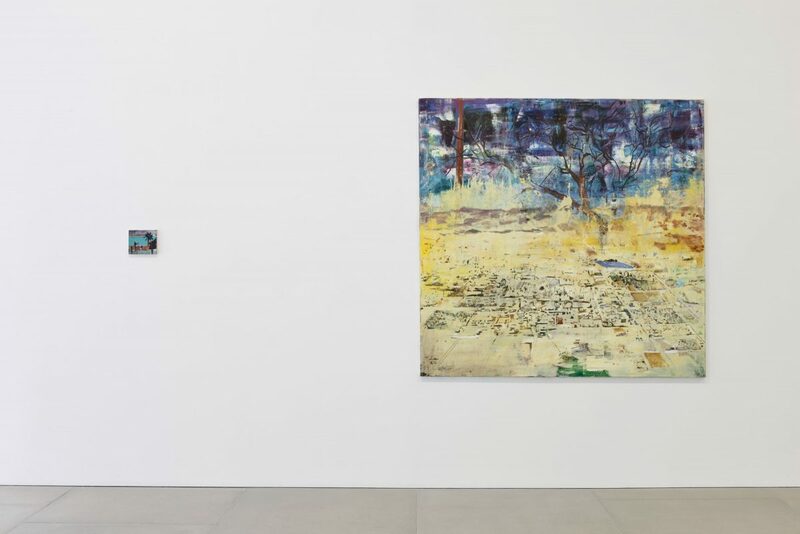 Bercea’s trip through the Californian desert is captured in the skies of both Suspended Animation (2013) and Roulette of the Night (2013). 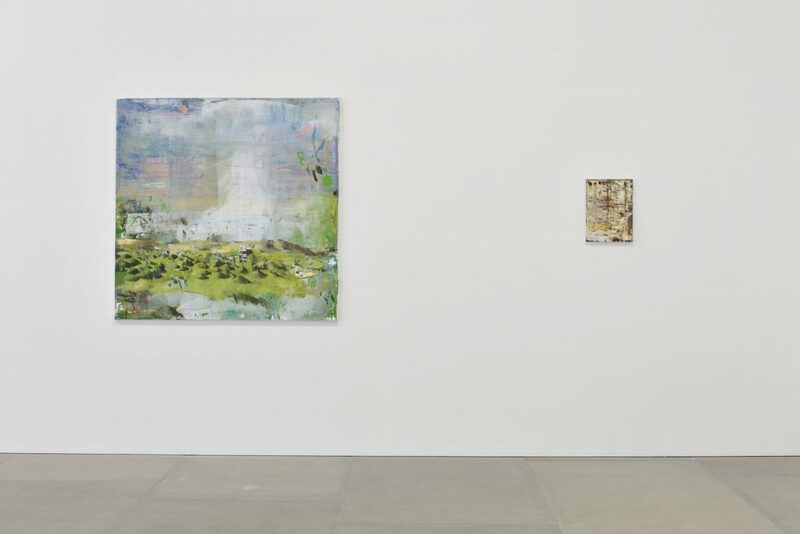 However, in both paintings the bottom section of the work represents scenes from Transylvania – the latter an industrial setting, the former a rustic green landscape, thus presenting an imperceptible fusion of two remote locations. Suspended Animation features a dark vista in which a blanket of stars lends emphasis to a dramatic sense of stillness and solitude, far away from the smoke and noise of civilisation – and perhaps signifying the presence of the artist himself, a Romanian sitting beneath the Californian night sky. 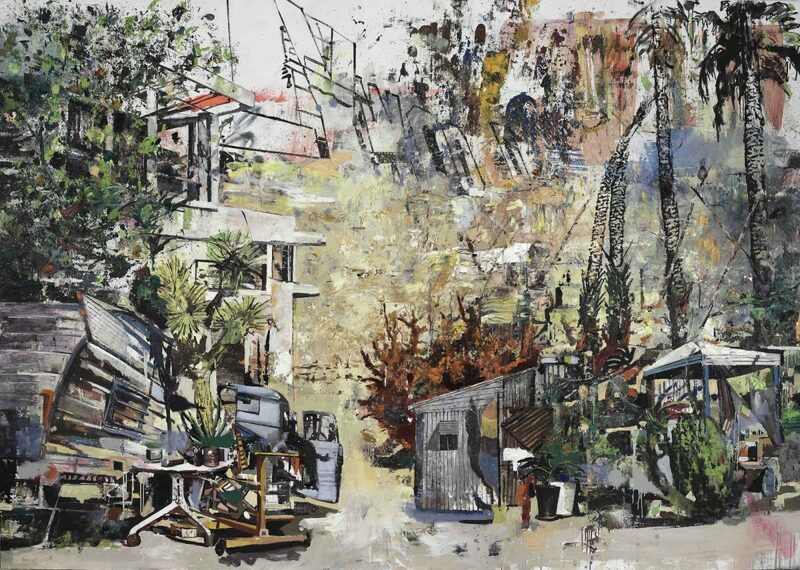 Bercea’s largest canvas in the exhibition, Seasonal Capital of Itinerant Crowds (2013) presents a patchwork of disparate imagery, brought together against the backdrop of the Hollywood hills. West coast palm trees rise up against a field of thick impasto paint, which threatens to consume the letters of the Hollywood sign, now disrupted and nearly obscured – as if slipping into disrepair. 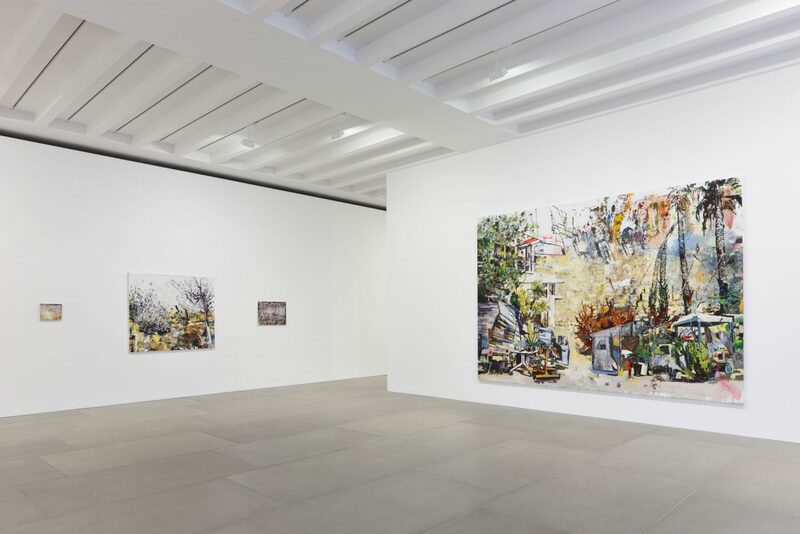 In the foreground, an array of seemingly temporary structures have set up camp; caravans and huts crammed against each other upon unstable ground – alluding to the itinerant communities that Bercea witnessed first-hand across the desert. 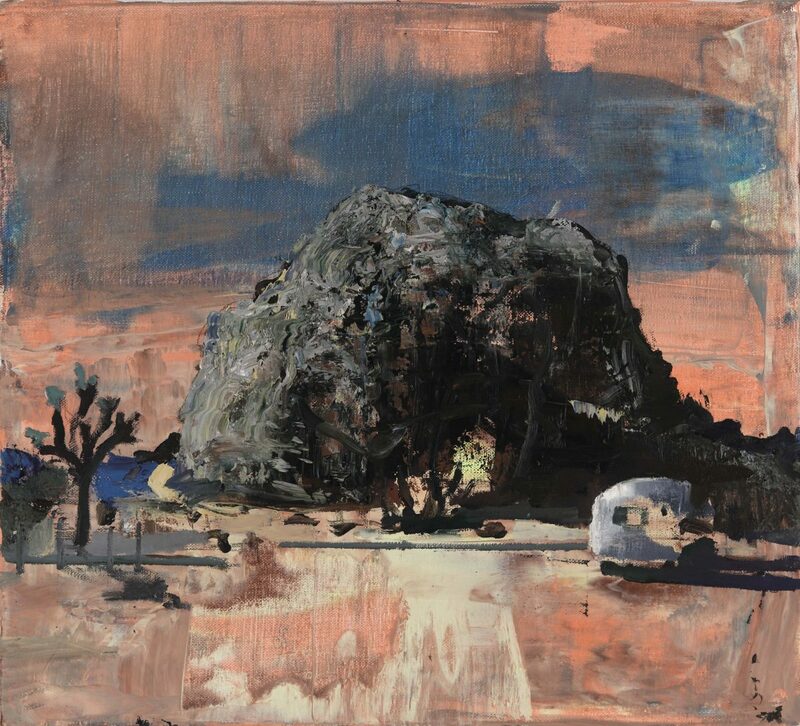 Opposite this sits a caravan with an open door – a direct homage to the myth of the traveller and the concept of the ‘American road trip’ that pervaded the writings of Ilif and Petrov, as well as 1950s beat literature, and the 1986 text America by Jean Baudrillard. The composition is completed by the looming corner of a bleached white building, a reference to the modernist architecture of the former Austro-Hungarian Empire that appeared in cities across Romania in the early twentieth century. These structures would go on to influence the architectural urbanisation of Los Angeles, by figures such as Rudolph Schindler and Richard Neutra. The jagged walls of this building merge with the Hollywood sign behind it, creating a historical and pictorial conjoining of the cultural iconography of both California and Romania. By re-interpreting reality through the lens of abstract sensation, Bercea not only uniquely conveys the overwhelming sensory spectacle of his experiences, but also exposes the cultural crossovers between two distant worlds. The exhibition will be accompanied by the artist’s first monograph, including over 60 full colour plates, an interview with the artist and three new essays by Michael Bracewell, Barry Schwabsky and Louisa Elderton.